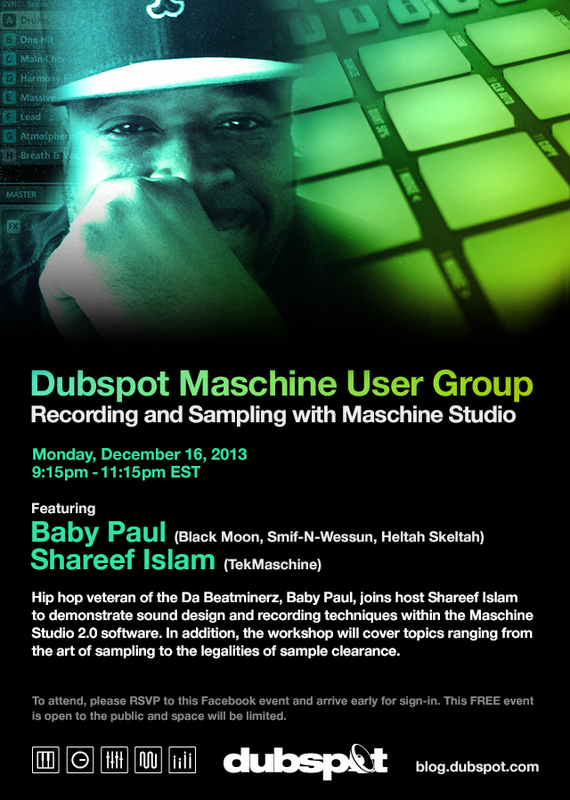 On Monday, December 16th, the Dubspot’s NYC Maschine User Group returns with a special guest lecture from Baby Paul (Black Moon, Smif-N-Wessun) who will demonstrate recording and sampling techniques with Maschine 2.0. On Monday, December 16, 2013 from 9:15pm-11:15pm, Dubspot will host a Maschine user group at our NYC location. Hip hop veteran of the Da Beatminerz, Baby Paul, joins host Shareef Islam to demonstrate sound design and recording techniques within the Maschine 2.0 software. In addition, the workshop will cover topics ranging from the art of sampling to the legalities of sample clearance. To attend, please RSVP to this Facebook event and arrive early for sign-in. This FREE event is open to the public and space is limited. Baby Paul is an internationally known record producer who has been in the music industry for just over 12 years. As part of the hip-hop production crew Da Beatminerz, he produced records over the years for groups like Black Moon, Smif-N-Wessun, Heltah Skeltah, O.G.C. Upon separating from Da Beatminerz in 2001 he’s worked with Fat Joe, Big Pun, Outlaws, Nas, AZ, Olivia, Angie Stone, & others. Over the years Paul has built strong relationships throughout the music industry with various artists, producers, A&R’s, engineers, managers & is constantly developing relationships with new up & coming talent ranging from unsigned artists, songwriters, music & film producers. Find out more here. « Dubspot Cyber Monday Sale Roundup! Deals from Ableton, NI, Livid, Arturia, Beatport, and More!